Skill need; not just hack and slash. A must buy and a lot of fun. About 3 years ago, myself, and a couple of GPers, were on our annual jaunt around Play Expo in Manchester, when we came across a big flat screen TV, surrounded by nice branding, Roman Helmets and an interesting looking Historic Hack and Slash game called….Wulverbalde. Now I’ll not give you a complete run down but in short we played a bit of the game talked to a nice chap called Mike, did an Interview (see below) and then went about our day; looking forward to the release of the game later that year. Issue is it didn’t, nor did it the next year, nor the next. I’d semi forgotten about the title to be honest when suddenly, last month, I got an email informing me that it was going to be out soon and did I want a review copy… ummm yeah! 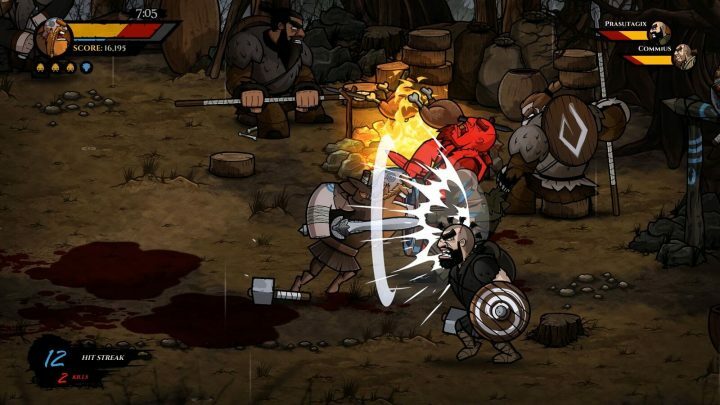 Wulverblade is a classic hack and slash type beatem up game where in you are a member of a Northern British Tribe, past Hadrian’s Wall, faced with the looming encroachment of your territory by Pro Roman forces and the Romans themselves. 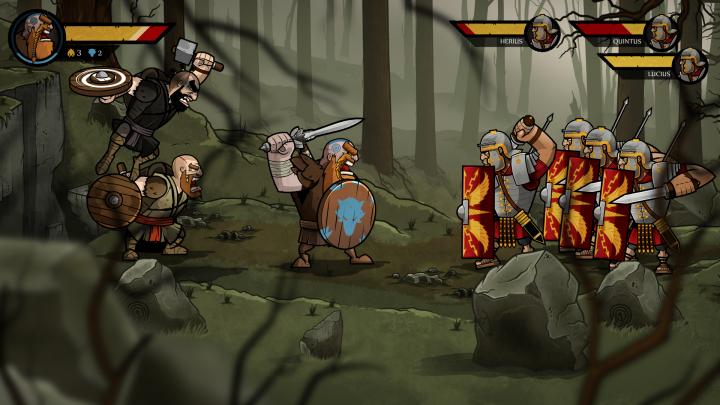 Using a variety of attacks and weapons you have to travel through the land, severing limbs, cutting off heads and generally showing the Romans why Hadrian’s Wall was built in the first place! As mechanics go, if you loved your classics like: Golden Axe, Turtles, Streets of Rage, Final Fight then you will need little introduction on how Wulverblade works. Each of the 3 characters has specific strengths and weaknesses, more damage, speed etc and using the attack button you hack away at your enemies, with slight variations, like the jump attack, a roll, a charge that knocks the enemy over, a close attack that allows you to throw them if you want and a once per stage attack that enables you to call in wolves to finish off your foes for you; so far no change. But where Wulverblade seems to differ slightly from its retro forebears is with things like ground kills, if an enemy is stunned, a heavy attack when you pick up and collect heavy weapons, a special attack that builds up power as you fight and lets you enter a berserker rage and even a block, something, especially on the games mentioned above, you were unable to do. On top of this you are able to use the environment to your advantage, picking up knives, spears , impale enemies on barricades and even use the peoples severed heads and limbs as projectiles; It honestly never gets old! If you add this to the cartoonish but beautifully rendered animation, replete with Slow motion, 300 style finishing strikes; an active foreground and background and of course the history within ,you have a nostalgic feeling game that delivers something more, and, in a lot of ways, improves upon it. Old school beatem ups tended to be just mindless button bashers that fed off how much money you could afford to put in, with skill being a minimal priority; my Girlfriends 6 year old girl showing this very aptly when she completed Golden Axe, on my emulator, in a few hours. With enough lives you can get past most, if not all levels, just by hack, slash repeat. This game though, as much as the hack, slash genre is a part of its bedrock, does not reply on it completely and I got the sense, after a few hours of doing said actions and dying.. a lot.. that more was needed and I would have to be wiser, use my power attacks, save my power up and use my damn shield! As it is you seem to have 3 levels of difficulty on campaign, with easy, Normal, (what I’m on) and Arcade, which only gives you 3 lives and 3 continues; very old school indeed, but double hard. On top of this there is also the arena mode which pits you up against increasingly harder enemies and doesn’t give you much life; I got up to wave 9 last night before being cut down by some armour wearing Romans. And if that wasn’t enough to keep you hooked there are achievements, collectibles, High scores and history lessons galore; that’s right you heard me, you learn while you play too. All this being said I do have one small gripe about Wulverblade and it’s not so much the game itself but my preference on button load outs and it would seem, on Xbox one at least, more intuitive to have the block button mapped to the left trigger so you can block then slash, block then slash.. as it is, the buttons are mapped only one way and I found it harder to use and therefore a harder game to play; would have been nice to have the option to change your setup.